In wake of Hurricane Irma, Florida activists serve the people | Fight Back! 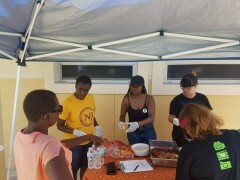 Read more articles in U.S.
Hollywood, FL — Activists involved in the Hollywood, Florida’s Change the Names campaign (which was successful in getting the city change three streets names that were named after KKK and Confederate leaders) grilled burgers in the low-income Liberia neighborhood. The activists walked plates up to folks who couldn't leave their homes. That community has been without power since Friday. No AC, no fridge, no oven, no way out. The activists were out the days after the storm before any local government or companies were setting up distribution centers. Participants included members of POWIR (People’s Opposition to War, Imperialism and Racism), Black Lives Matter Alliance Broward and SEIU.